We spent N100m on Dino Melaye’s failed recall – INEC – Royal Times of Nigeria. 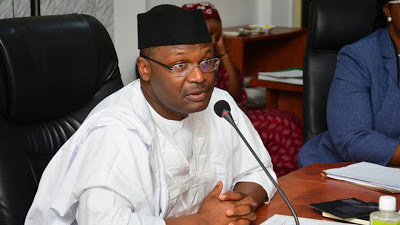 The Chairman of the Independent National Electoral Commission, Prof. Mahmood Yakubu, says N100m was spent on the failed attempt to recall Kogi-West lawmaker, Senator Dino Melaye. The INEC chairman said this while responding to a question posed by this reporter at a press conference in Abuja on Friday. Yakubu said the figure was nowhere near the N1bn being reported by the Peoples Democratic Party. 100million? Y do we have leaders that re not sincere? Nigeria is a failed nation! Courtesy of our leaders. Wow Thunder go strike all of u.